It's my final Five to Follow story of the first half of the 2017 season, with games to resume after the All-Star break on Friday. Monday-Thursday is arguably the longest four-day stretch of the year for sports bettors because there's just nothing going live those nights to bet on other than the occasional MLS game. It's also why ESPN shows the god-awful ESPYs during the break. I might actually watch Monday's Home Run Derby from Marlins Park in Miami. I didn't used to because it got stale and ESPN's Chris Berman drove me nuts. He's off the telecast this year and the competition looks very interesting with Giancarlo Stanton, Aaron Judge and Cody Bellinger all in it. Stanton is the top seed in the eight-man single-elimination bracket-style event. He won it last year with a record 61 bombs and is the +120 favorite Monday in his home park. He opens against No. 8 seed Gary Sanchez of the Yankees. Judge and Bellinger are going to be their respective Rookies of the Year in the AL and NL. Judge is the No. 2 seed and priced at +163. He opens against Miami's Justin Bour. Bellinger (+900) is the No. 3 and will face the weakest power hitter of the eight in the Rockies' Charlie Blackmon. So if chalk holds, we'd have Stanton vs. Mike Moustakas (+1400) in one semi and Judge-Bellinger in the other. Than Stanton-Judge in the final. That would be must-see TV. MLB Network national TV game at 1:05 p.m. ET. Milwaukee has lost excellent utilityman Eric Sogard to the 10-day disabled list with a sore ankle. Sogard had essentially taken the second base job from Jonathan Villar as Sogard is hitting a team-high .331. He's a career .248 hitter so this is obviously a fluke. The Brewers start lefty Brent Suter (1-1, 3.00). He comes off his first big-league win in his second start of the season (ninth appearance), allowing one unearned run over six innings against Baltimore. He became the first lefty to earn a win for the Brewers at Miller Park since Randy Wolf in July 2012. New York All-Star Luis Severino (5-4, 3.52) - I'm not sure he deserved that spot - was shelled in Houston in his last start, allowing six runs and nine hits over 5.1 innings. He has never faced the Brewers, who add the DH, but Stephen Vogt is 2-for-5 off him. Travis Shaw is 0-for-6. Key trends: The Yankees are 6-1 in Severino's past seven vs. teams with a winning record. The "over/under" is 5-0 in his past five vs. teams with a winning record. Early lean: Brewers on runline (Yanks -220?!) and over. Also an MLB Network TV game with a 4:05 p.m. ET first pitch. Nationals All-Star Stephen Strasburg (9-2, 3.28) celebrated that selection with a dominant seven innings against the Mets last time out, shutting them out on two hits with six strikeouts. As good as Strasburg has been in his career, it might surprise you to know it was only the second time in his career that he went at least seven scoreless innings and allowed two hits or fewer. Strasburg is 2-0 with a 4.58 ERA in three starts this year vs. Atlanta. Freddie Freeman is a career .368 hitter off him with four homers and 13 RBIs in 38 at-bats. The Braves' Julio Teheran (6-6, 5.14) won in Oakland last time out (6.1 IP, 2 ER). He apparently doesn't like SunTrust Park much as he's 1-6 with a 7.58 ERA at his new park but 5-0 with a 2.88 ERA in eight road starts. Teheran is 1-1 with a 7.36 ERA this year vs. the Nats. Bryce Harper kills him, going 16-for-36 with seven homers and 17 RBIs. Washington has placed outfielder Michael Taylor on the DL with an oblique injury. 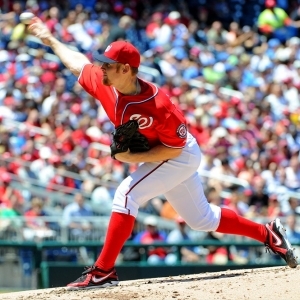 Key trends: The Nats are 8-2 in Strasburg's past 10 vs. Atlanta. The Braves are 1-8 in Teheran's past nine vs. Washington. The over is 4-0-1 in Teheran's previous five vs. the Nats. Early lean: Braves on runline and under. I can't speak to the worst follow-up season ever for a Cy Young winner, but the worst this century so far had to be when the Angels' Bartolo Colon was 1-5 with a 5.11 ERA in an injury-shortened 2006 campaign. He was 21-8 with a 3.48 the year before in winning the Cy. I mention this because Boston's Rick Porcello could unseat Colon for that unofficial title. Porcello (4-10, 5.01) does come off a quality start vs. Texas (6.1 IP, 3 ER) but took a no-decision. Porcello has given up at least three earned runs in seven consecutive starts. He's 0-2 with a 9.58 ERA in two starts this year vs. the Rays. All-Star Corey Dickerson is 8-for-25 with four doubles and a homer against him. Tampa's Alex Cobb (6-6, 4.01) had a string of four straight quality starts end last time out vs. Baltimore, getting rung up for seven runs in 6.1 innings. Cobb, who is from Boston, is 1-0 with a 5.56 ERA in two starts vs. the Sox. Xander Bogaerts is 4-for-8 against him - if he plays. Bogaerts was hit on his right hand Thursday by a pitch, but X-rays were negative. Key trends: The Sox are 4-1 in Porcello's past five at Tampa. The Rays are 1-5 in Cobb's previous six at home vs. Boston. The over is 4-0 in Porcello's past four vs. the Rays and 6-1 in Cobb's previous seven against Boston. Could this be Justin Verlander's final start for the Tigers? I rather doubt he's traded overall much less over the All-Star break, but it's possible. The Tigers probably are better off dumping his $28 million salary, but apparently they also have the audacity to be asking for a big haul back. Good luck with that. Verlander (5-5, 4.96) has been the face of the franchise since 2006. He didn't help his value last time out, getting pounded for seven runs and nine hits in a loss to these Indians. Verlander's streak of 331 games with at least one strikeout ended in that one. Verlander was tied with Curt Schilling for the sixth-longest streak since 1913. He had not gone without a strikeout since April 28, 2007, when he lasted only three innings against Minnesota. Verlander's ERA in three starts vs. Cleveland this season is 11.30. He has a 3.87 ERA against all other teams. All-Star Jose Ramirez hits .440 off him in 25 at-bats. The Tribe's Mike Clevinger (4-3, 3.33) was opposite Verlander last Sunday, allowing one run over six innings. Key trends: The Tigers are 2-9 in Verlander's past 11 vs. Cleveland. The over is 5-2 in his past seven there. Monitor the status of Texas second baseman Rougned Odor and third baseman/outfielder Joey Gallo here. Odor was hit on the left wrist by a pitch Wednesday, but X-rays were negative. Gallo had hamstring soreness and was pulled from the same game. With the break upcoming, it might make sense to sit both the rest of the weekend. The Rangers' Tyson Ross (1-1, 6.41) gave up four runs over five innings at the White Sox last time out in his fourth start of the season. He has held opponents to a .214 batting average but walked 11 in 19 2/3 innings. The Angels' Albert Pujols is 1-for-10 career off him. L.A.'s Jesse Chavez (5-9, 4.97) has lost three of his last four outings, surrendering 11 runs across 21 1/3 innings over that span. He's 0-2 with a 7.84 ERA in two starts this year vs. Texas. Odor is 5-for-11 off him with two homers. Mike Napoli is 4-for-15 with two homers. Key trends: The Angels are 1-6 in Chavez's past seven vs. the AL West. The under is 5-2 in his previous seven. The over is 7-3 in Texas' previous 10 on Saturday. Early lean: Rangers and over (even with super high total for non-Rockies home game). WOW!! $60 of member's baseball picks absolutely free with no obligation - click here . Get free baseball picks today at Doc's Sports baseball predictions page .